Proving that you can never guess what you'll find when you clean out the basement, a man of the cloth discovers that ultimate evil has made a hiding place in his cellar in this tale of terror. Father Loomis (Donald Pleasance) is a priest who discovers a strange object in a church basement -- a canister filled with a swirling and volatile green substance. With the help of Professor Birack (Victor Wong), Loomis discovers the startling truth about his find -- it seems that Satan, who is actually an alien life form, had a son, and the essence of the devil's spawn is trapped inside the canister. The evil spirit has been guarded by a group calling themselves The Brotherhood of Sleep, but the spirit has the ability to free itself whenever it decides the time is right...and it seems that time is just around the corner. 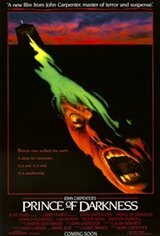 Prince of Darkness was directed by horror master John Carpenter; he also wrote the screenplay under the pseudonym Martin Quatermass.